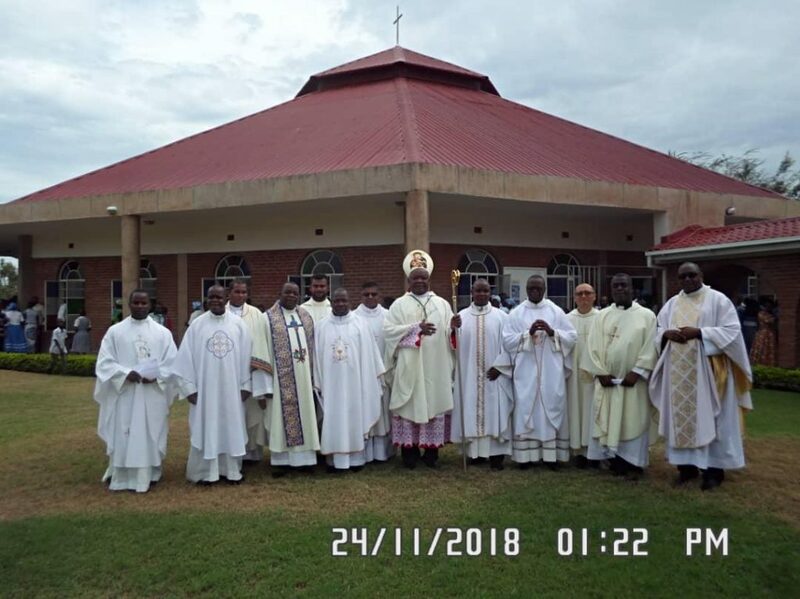 On Saturday 24th November, 2018, Bishop Martin Anwel Mtumbuka of the Diocese of Karonga closed the Diocesan Year of “Our Small Christian Community” with a call to Christians to yearn for the kingdom of God. Bishop Mtumbuka made this call during this year’s Thanksgiving Mass at St Joseph the Worker Cathedral in Karonga, marking the end of the liturgical year. During a similar function last year, the Bishop proclaimed 2018 the Diocesan Year of Our Small Christian Community. 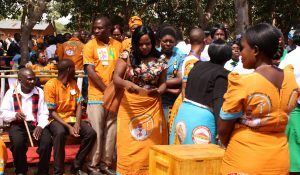 Thanksgiving Mass is an annual celebration of the Diocese of Karonga celebrated on the eve of the Solemnity of Christ the King, the last Sunday on the liturgical calendar. In his homily, which centred on the theme “Adveniat Regnum Tuum – Thy Kingdom Come”, the Bishop said Christ as King is also the Judge of the living and the dead. The Bishop exhorted the faithful to be dedicated in serving those in need as this is the way to the Kingdom of God. Reflecting on the Last Judgement scene in Matthew 25: 31-45, the Bishop said the kingdom of God is reserved for those who selflessly serve others and not those who serve themselves. He said the way to God’s judgement is determined by the service we render to the suffering (the thirsty, the imprisoned, the sick, the naked) whom Jesus calls His brothers and sisters. “The Solemnity of Christ the King reminds us that one day our souls will reach the presence of God to get our reward; salvation. And every week when we recite the Creed we profess that Jesus will come again to judge the living and the dead.” the Bishop said. Bishop Mtumbuka further said Christ’s kingdom is not of this world, it is the kingdom of heaven. He further said this is the reason we pray, “Adveniat Regnum Tuum (Thy Kingdom come)”. “In this world there are good things, but there are also painful experiences, sorrows, accidents, wars, poverty, diseases, lack of medicines in hospitals, corruption and theft, witchcraft accusations, envy, violence against the elderly, children and women. 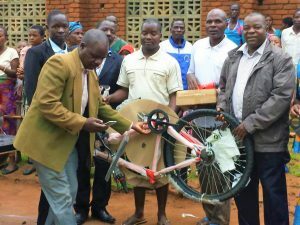 This is why we pray for the coming of the Kingdom of God, Adveniat Regnum Tuum,” said Bishop Mtumbuka. The Bishop, further, said Christians should strive to be counted worthy to stand in the presence of God and receive their reward. Referring to Revelations 22:20 where the author says “Maranatha – Come Lord Jesus” and the Lord responds “I am coming soon with my reward” the Bishop urged Christians to yearn for His coming. “The Lord will come to wipe away our tears. Let us pray to the Lord to help us all to stand before him, to receive the reward of our service and to receive us in his kingdom,” said the Bishop. Speaking during the function, Mr Joseph Nyondo of the Laity Council thanked the Bishop for the “Year of Our Small Christian Community” which he said has registered successes like; increase in number of men attending SCC gatherings, a deepened understanding of the importance of SCCs, strengthened unity within and among choirs as a result of their participation in the “Uzengezgani Withu” Choir Festival among others. During the Thanksgiving Mass, Christians from all the parishes and Catholic institutions, within the Diocese, made contributions towards the running of the Diocese. The total amount collected was K7,118,815.00. 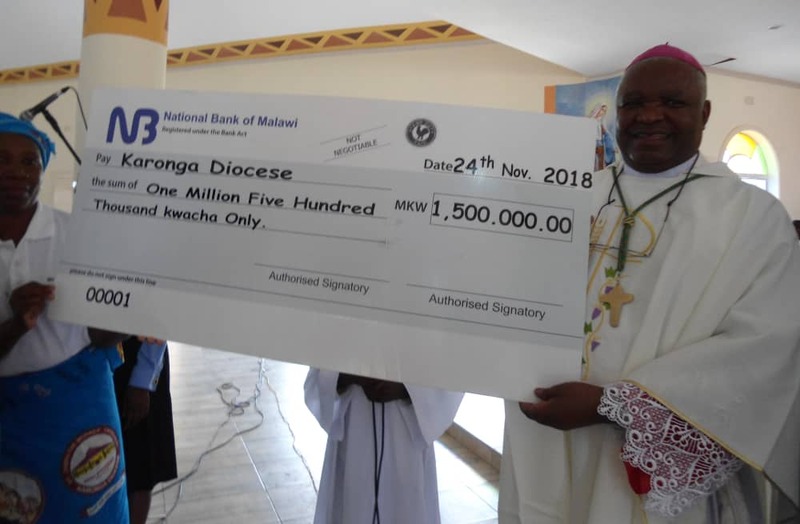 Out of this the affiliates of Karonga Diocese from Mzuzu, Kasungu, Lilongwe and Blantyre contributed about K2.9 million and forty iron sheets. 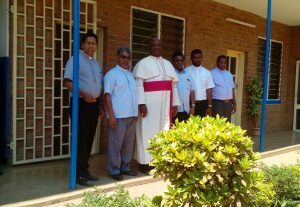 During the same function, the Bishop awarded outstanding Catechists who have served the people in their areas with utmost dedication in the year 2018. The Bishop also awarded outstanding employees from different sections of the Diocese. Thanksgiving Mass is celebrated on the eve of the Solemnity of Christ the King to give thanks to the Lord for the graces received in the liturgical year and also for the gift of the Diocese which was inaugurated on 20th November, 2010. This year the Diocese has clocked eight years.